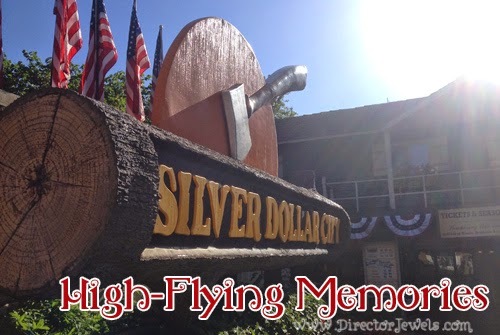 When I was a kid, my parents took me to Silver Dollar City in Branson, Missouri all the time. I may have never gone to Disney World, but I knew this 1880's-mining-town theme park like the back of my hand. It was - and remains to this day - one of my favorite places on earth. We took visited Silver Dollar City at Christmas with our kids last year, and took a family trip there this summer. I have a lot of memories of "firsts" at Silver Dollar City. My dad coaxed me onto my first roller coaster there (Thunderation - I was terrified). I ate a stir-fry meal with my best friends when I was a teenager (picky eater here - definitely hadn't tried that before). I went on an underground cave tour and was astounded at the hidden secrets below the park. And I've eaten some of the best cinnamon rolls of my life more than once in that park! 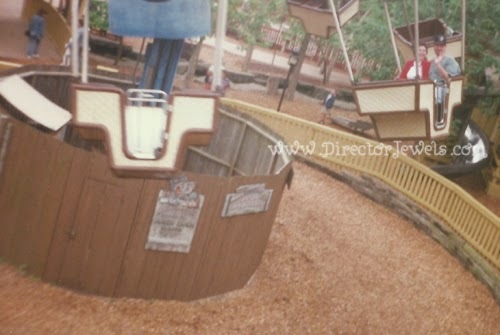 When I heard that Silver Dollar City was planning a big revision in 2015 that involved the removal of the Geyser Gulch children's play area, a chord in my heart felt a little pained. I remember the first year that Geyser Gulch was open and have silly photos playing with my dad and brother there when I was maybe twelve. I was afraid that the memories of this fantastic park area would fall by the wayside, like a few other things from the park's history. My cute parents riding Skychase Balloons in 1997.
like that maybe the balloon tops should be in this photo too!. 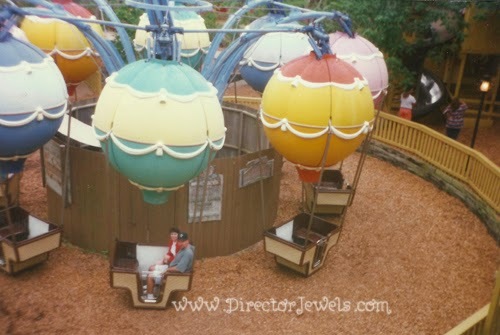 When I was very young - maybe the first time we went to the park - my dad asked if I wanted to ride the spinning balloon ride near the center of the park. We asked the ride attendant if it went very high or very fast, and were told that it was a moderate ride and shouldn't be very frightening. I climbed aboard. And was terrified when those high-flying balloons and their passenger baskets lifted off the ground. 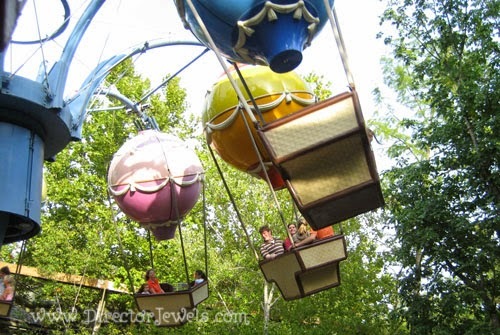 Over the years, I overcame the fear and enjoyed thoroughly the "balloon ride," as we called it. 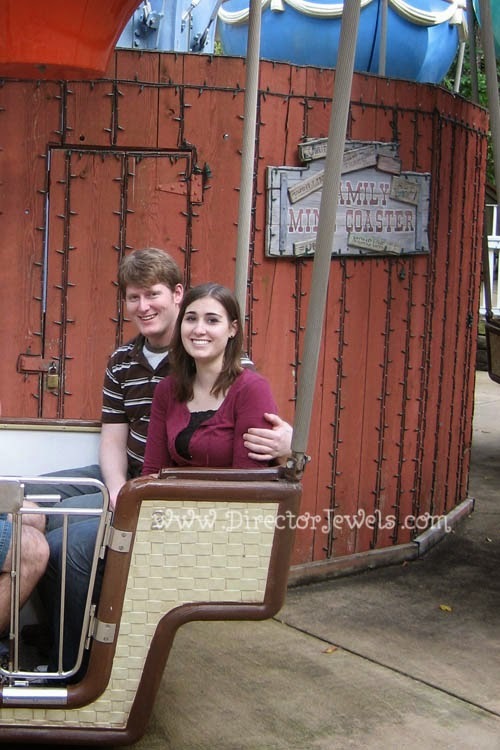 The last time I rode it was in 2007, when I was at Silver Dollar City for an adventure with my new boyfriend, this guy I met at a community theatre, named Andrew (hint: I married him). Aw, look at us being all cute on a date. 2007. After that trip, the little hollow that Skychase Balloons and Hugo & Mary's Carousel rested in was redone and the rides disappeared. The carousel reappeared in Half Dollar Holler and my kids love it now. I lamented over the balloons each time we walked past where they used to be. So when I read this news announcement that Geyser Gulch would be no more...I feared the worst. That it, too, would only live on in my memory. Andrew and me in the yellow balloon basket, 2007. But last week, the 5-Alarm Announcement arrived in my inbox, stating that Fireman's Landing would be arriving in the summer of 2015. My son has adoration on his face anytime he sees anything firetruck or fireman themed and we even had a firetruck birthday party this year, so I thought....okay. This might be good. The new family adventure area will feature ten new rides and play zones, including a foam ball area (so Geyser Gulch will live on - yay), a soft play area for toddlers, a low-flying swing ride for young kids, and more. It sounds like they are really planning to envelop the whole family, even very young kids, in this section of the park and that makes me so thrilled! Image Courtesy of Silver Dollar City. Then, when I was looking over the concept art, I spotted it. In the right corner, a ride that will be called Fire Spotter that features balloons which will fly up in the air to enable all the junior firefighters to have the best visibility for any looming disasters. My heart skipped a little beat. Because Fire Spotter looks an awful lot like a ride I knew a few years ago. I contacted Silver Dollar City via twitter on a hunch. They're great at replying on social media and got back to me right away with a confirmation of my question. Fire Spotter is the same balloon ride that holds many, many lovely memories from my childhood and my falling-in-love days. You'd better believe I will be there next summer to ride this old/new adventure with my kids. And if they're terrified when those balloons take off into the sky...well, we'll just be making some new memories together.